We are now offering demonstrations of Audéo V, a new generation of hearing aids powered by the cutting-edge AutoSense OS. 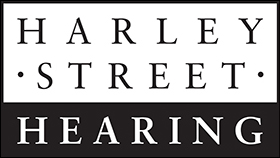 Harley Street Hearing have been specially selected to offer our clients these new intelligent devices which represent a revolution in seamless and effortless listening especially in noisy environments. In a sleek, modern design and a shell reinforced with high-tech composite materials, Audéo V is available in four performance levels and offers a wide choice of colours to either blend in or stand out from your hair or skin tone. Extracts the single voice you want to hear from a noisy crowd.When noise reaches a level that makes understanding one person in a crowd difficult, StereoZoom is automatically activated, allowing you to focus on the voice you want to hear. Understand speech from any direction. Automatically selects the direction of speech and sends this speech signal from one ear to the other, improving speech intelligibility without the need to face the speaker. Tinnitus Balance noise generator. The Tinnitus Balance noise generator is a feature available for every Phonak Audéo V model. It generates a sound which reduces the annoyance of tinnitus and can be used in sound enrichment tinnitus therapies. If you require any further information on this or any other new technology we’re happy to help.